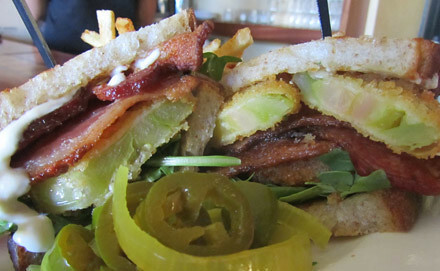 Did you see my recent post about sandwiches I’ve been enjoying at home, which included a BLT? Well, leave it to Restaurant One53 in Rocky Hill to raise the bar – really, really high. You can only get this when they serve lunch on Thursdays and Fridays, so I (sequested on the PU campus weekdays), won’t get to try this – hey One53, do you deliver? But you can get an appetizer at dinner of just the fried green tomatoes with dipping sauce. This is what you do with those last tomatoes that won’t quite ripen in your garden. Pick that green gold without delay, slice thick, dip in buttermilk, dredge in cornmeal, and fry in oil…or, gasp!…a little bacon fat and oil. Woo hoo!